Simple, hardy and nutritious. These are the easiest epithets to describe the food of Kumaon and Garhwal. Ghee-lathered rotis made of ragi or mandua flour, chutney made from hemp seeds or bhaang, dal dished out from the wonder legume gahat (horse gram lentils) and bhatt (black soybeans), paired with aloo ke gutke and raita which is seasoned with mustard seeds and turmeric—this is gold-standard pahari fare found in households, homestays and restaurants across Uttarakhand, serving up Kumaoni thalis. But you will be hard-pressed to find restaurants brave enough to lend a contemporary twist to the age-old, salt-of-the-earth classics from the Himalayan district. Although chefs in metropolitan cities exoticize superfood ingredients from Garhwal in their menus as remote homegrown crops, few have dared to merge it with Western culinary staples. 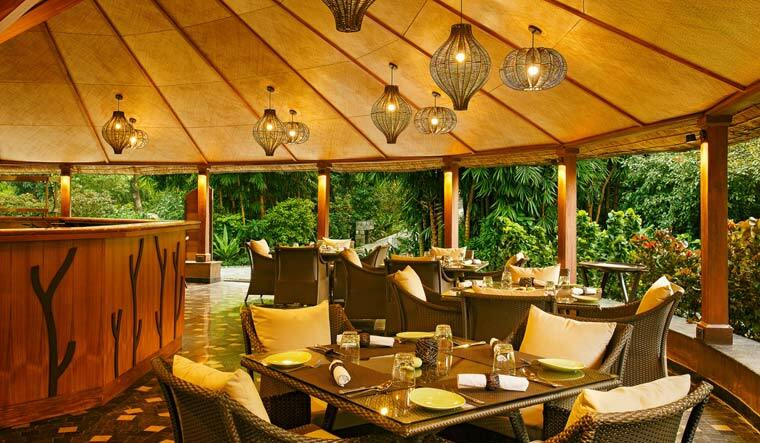 But Jim's Grill at Taj Corbett Resort & Spa in Uttarakhand is set to shake things up a little with their cautious, incremental reshuffling of ancient recipes from the native soil. Sample this: Stuffed mandua enchilada, pahadi aloo ki gnocchi, vialone nano arancini with jholl or bamboo leaf-wrapped lentil-crusted river sole served with wild mushroom tempered nicoise-style salad. These are vignettes from the menu of Jim's Grill which has taken on the daring task of modernising Kumaoni food with European and Asian inflections. Set close to a ridge, snaking over the riverine bed of Kosi, abutting the Jim Corbett National Park, the restaurant is a balm for the weary and the worn. Alfresco dining under a star-spangled sky, a soloist's voice wafting in the gentle breeze and mellow shafts of light from a bonfire set the tone for an evening filled with scrumptious, atypical Kumaoni meal in an atypical Taj property which spares no effort to be an elegant safari lodge and match the tall legacy of hunter, tracker, conservationist and author Jim Corbett. "When I first joined, we were serving sizzlers and other such continental fare. Then we thought we should only serve Himalayan food from Kashmir all the way to Arunachal," says chef Rohit Joshi who joined Taj Corbett in July last year after stints in ITC, Grand Hyatt and Umaid Bhawan Palace. "But soon we decided we should simply stay focused on Kumaoni food. I said let us present it in a different manner. The idea of revitalising the cuisine and the concept was long-time pending," says Joshi who reset the menu of Jim's Grill in September. For his mandua enchiladas, for example, instead of refried beans he uses bhat dal which forms an integral part of Kumaoni diet. A popular dish like Bhangeerey wala jhinga is replaced with machi or river sole, the most easy-to-find fish in the state. Kadhi-chawal is replaced with arancini in jholl and Gulkand shots are infused with rhododendron flower jelly for dessert. "This reworking of our cuisine has not been done anywhere till date. No one in Uttrakhand is doing this, I am sure," assures Joshi, who is a native of Nainital himself. It is fairly easy to spot standalone restaurants serving regional food from Manipur, Nagaland, Assam, Bihar, Karnataka, Dharamshala, Kashmir, Goa or Kerala in big cities. But even under the rubric of the catch-all Himalayan food, the distinct flavours of Kumaon are conspicuously absent. The understanding of Himalayan food is a drooling mix of of Chinese, Nepalese, Sikkimese and Tibetan food at best. Whereas the regular pahadi grub with a bewildering variety of lentils and local greens are waiting to burst on to the mainstream palate. When a food culture has multiple iterations of bhaang (marijuana) and bichchu ghaas (stinging nettles) in their regular diet, you've got to sit up and notice.